The following list of items are used in our Pirate Packs. Each item is a single serving as well. We need the items you donate to be individually packaged. Thank you so much for your assistance! The donation sites listed above allow you to place items in our blue barrels which are collected monthly and added to our inventory for distribution. Currently, we receive about 10% of our needed supply of food this way. We meet behind Payne Rec Center to fill the Pirate Packs. Anyone is invited to come and be part of the packing process. We encourage anyone who has a free evening and wants to attend during those times listed on Facebook to come on out and be part of the terrific mission of feeding kids on the weekends. 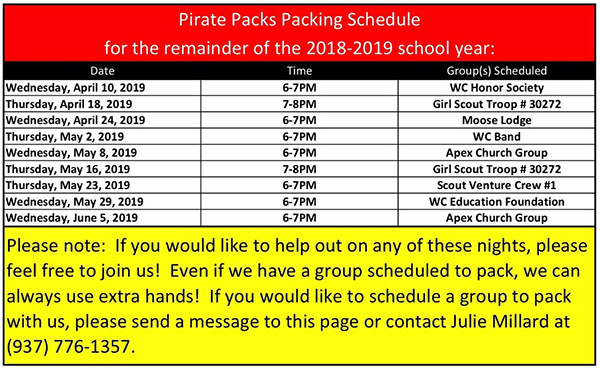 We are always scheduling new days, so if you are interested in packing with us, please contact our scheduling coordinator Julie Millard @ 937-776-1357 or you can email us @ Piratepackschedule@gmail.com. If you open an account with Kroger and then add your Kroger Plus card, they will donate a small percentage of your actual spending to Pirate Packs! to sign up. The code for Pirate Packs is IF384. 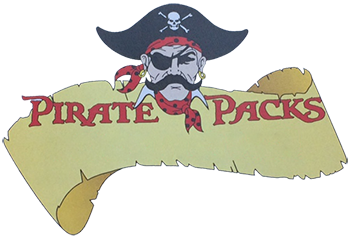 If you shop Amazon, click the link below, and a percentage of your purchases will come to Pirate Packs.